PYONGYANG — Officials in North Korea have sentenced a Virginia student to 15 years hard labor for stealing a political poster from a hotel—an act that the student claims he was urged to do as a “church trophy” in exchange for a car. Otto Warmbier, 21, a University of Virginia undergraduate, was charged with subversion and sentenced on Monday by the North Korean Supreme Court, which considered the theft of the banner as part of an anti-regime plot in cooperation with the U.S. government. Warmbier had been taken into custody in January as he sought to board a flight back to America from the Pyongyang Sunan International Airport. It was found that while touring the country on a trip organized by the Chinese-based Young Pioneer Tours, he had stolen a poster from a North Korean hotel. Last month, Warmbier was brought out before reporters to read a confession, during which time he said that he took the banner for the mother of a friend who allegedly wanted the sign as a “trophy” to display at Friendship United Methodist Church in Wyoming, Ohio. He said that the friend had offered a used car worth $10,000 in return for the poster. Warmbier also stated that he had been told that if he was detained, a donation of $20,000 would be made to his mother. 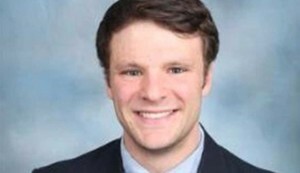 He stated that he agreed because his family was “suffering from very severe financial difficulties.” Warmbier also said that he was trying to join the University of Virginia’s “Z Society,” which he claims encouraged him in the act as well. Christian News Network contacted Friendship United Methodist Church, led by Meshach Kanyion, to obtain comment as to whether there was validity to Warmbier’s claim. Secretary Nancy Feverston, who took the call, laughed and said that they were not offering any comment. Warmbier tearfully pleaded for mercy last month as he read from a statement, which some question as possibly being scripted by North Korean officials. Organizations such as Human Rights Watch believe that Warmbier’s sentence is too harsh for the theft of a political poster.